Business battle with smart AI. Qualified addictive and exciting game. "MONEY MONEY POLY" is a fusion of the card-battle game and the board game(like the Monopoly). You can enjoy the thrill of the card-battle game and the addictiveness of the board game simultaneously. You'll walk on the way for the master of restaurant business. Work proceeds by your dice. Roll the dice and make corresponding moves. In the land you arrive, a special event will happen. At a store of yours, you can collect money. But at enemy's store, you must pay a toll. There are various cards(chance card and franchise card). Those cards help your business. You must use cards effectively to win the game. It is similar to the magic card of the trading card game. It is a very important fact which makes this game exciting. Anyway do your best to earn the goal money earlier or bankrup your rival. The rule of this game isn't difficult. Just choose what you want as the flow. You can try the donut business game in the Arcade mode separately. 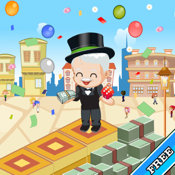 Easy and addictive the 'MONEY MONEY POLY' will keep your adrenaline going.